There's so much going on in our efforts for advocacy and the reactions of our communities, we hope this page helps to serve more information to let you know what it is that is currently happening. There's always an effort we're trying to push with issues, agenda, campaigns, political bill, events, and more. It's been nearly a week since news outlets began reporting on the devastating tragedy of a disabled student who lost his life while at school in El Dorado Hills, California. Restraining a human being, a student, to the point of death or for any reason is unacceptable. We, the California Foundation for Independent Living Centers (CFILC), are deeply saddened and dismayed to learn about the death of Max Benson, a student with autism from Guiding Hands School on November 28. The information circulating about the incident reminds us that our advocacy to end restraints and seclusion needs to be prioritized. 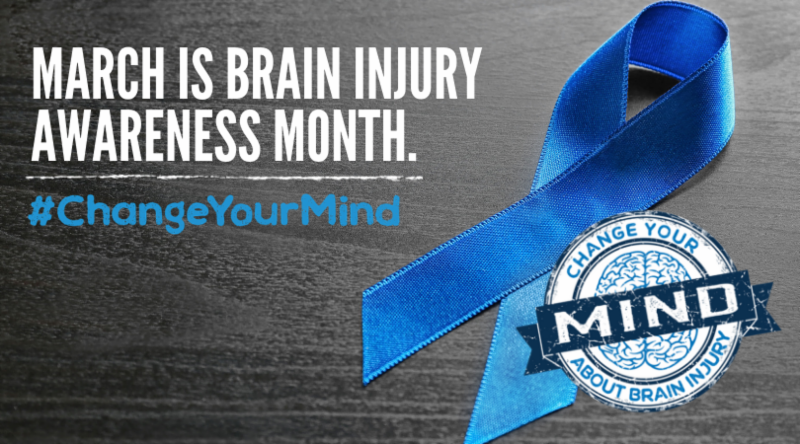 For over 3 decades, the Brain Injury Association of America has led a national effort to designate each March as "Brain Injury Awareness Month" in order to educate the public about brain injuries (TBI). The theme for its 2018 to 2020 campaign is #Change Your Mind. The campaign seeks to remove stigma or negative thinking around brain injuries by reaching out within the brain injury community and empowering those who have survived brain injury and their caregivers. In addition, it promotes public awareness about the supportive services available to survivors and their families. Nationwide, TBIs cause $76.5 billion in annual direct and indirect medical and rehabilitation costs and the loss of productivity. There are numerous causes of TBIs including, among many others, vehicle and bicycle accidents, slips and falls, combat-related injuries, or other trauma. Each survivor typically is left with an average $7 million in lifetime costs for care and rehabilitation. In 1988, the Legislature established the California TBI Program. It was designed to fund local community-based models to provide community integration services for people with TBI and their families. The program is currently administered by the Department of Rehabilitation. TBI Program originally funded 4 TBI pilot programs. By 1995, the number of TBI sites grew to the current 7 sites and they are represented by an advocacy organization the California Association of Traumatic Brain Injury (CATBI). • Central Coast Center for Independent Living- New Options serving Monterey, San Benito, and Santa Cruz counties. • St. Jude Brain Injury Network serving Orange County. These critical services are unmet by any other service delivery model. They include Supportive Living Services to find and maintain housing; Community Reintegration Services for rehabilitative therapies, chemical dependency programs, and personal assistance and education; Information and Referral Services connecting consumers with TBIs and their families to local community resources and advocates; Vocational Supportive Services to coach finding and retaining employment; and Public and Professional Education to educate the community and professionals on issues relating to TBIs. Although the program has proven effectiveness, it's been severely underfunded for many years and base funding has not kept pace with rising costs. This, in turn, has limited the ability of the sites to adequately meet existing service demands or to expand their service delivery areas and the populations served. Over the past 30 years, the size of the TBI population and the need for services have grown throughout California. However, services are currently available in only 20 of the 58 counties because the annual $150,000 in funding per site has remained frozen with no funding increases or cost-of-living adjustments. This means that when adjusted for inflation, it would require $320,000 in 2019 dollars just to keep pace with the value of 1988 dollars. Compounding the problem is the fact that in some recent years the funding has fallen to $115,000 per site. The gap between the demonstrated and growing need for TBI services and future expansion explains why CATBI welcomed news that Governor Newsome's budget for 2019-2020 proposed $1.2 million in state funding. This would restore funding to the historical $150,000 per site level through 2024. On March 6, 2019 CATBI members, TBI survivors, and their caregivers offered eloquent and heartfelt testimony at an Assembly budget subcommittee hearing in support of the Governor's proposal. They described the impact of TBIs on their lives and the value of CATBI's services. They also plan to testify at the upcoming May 2nd Senate budget subcommittee hearing. There is growing support for stabilizing and expanding the California TBI Program. A companion social media campaign is underway, so March 2019 ultimately may prove to be an important first step forward to expand public and lawmaker support for TBI services.